The biggest prize in motor rallying will be won in the UK in less than two weeks time when France’s Sebastien Loeb and Finland’s Mikko Hirvonen go head-to-head for the FIA World Rally Championship crown in one of the most challenging events of the year – the season finale, Wales Rally GB, from 10-13 November. Loeb, competing for Citroen Total World Rally Team, has emerged as the most successful rally driver in history with seven consecutive World crowns in the past decade. But Hirvonen, who drives for the UK-based factory Ford Abu Dhabi World Rally Team, could be about to end the seemingly invincible Loeb’s reign at the top. The Frenchman will arrive in Wales with a slender eight-point lead over the Finn – but with 25 available for a win the game is very much still on. Furthermore, an increasing number of rival crews – including those from iconic British manufacturer MINI – will be challenging for victory on some of the world’s most daunting forest stages. There is no doubt the WRC season is all set for a highly dramatic and unpredictable finish. Hirvonen almost pipped Loeb to the WRC crown in Wales in 2009, only for his car’s bonnet to smash into its windscreen. Two years on Hirvonen can expect great support from his on-form team-mate Jari-Mari Latvala. The ‘flying Finn’ now has much more experience and, having pushed Loeb for the win in Spain two weekends ago before backing off and allowing Hirvonen to finish second, could play a crucial role in the title outcome. Equally Loeb’s team-mate, fellow Frenchman Sebastien Ogier, is likely to play a similar tactical supporting role for Citroën. Although only in his second full WRC season Ogier is equal on five wins with Loeb so far in 2011. And maverick Norwegian Petter Solberg, one of only two drivers to have previously won the event four times (2002-03-04-05), is another they all need to watch in his Citroën DS3 WRC. However many of the hugely enthusiastic spectators will surely be rooting for the MINI World Rally Team and its pair of Mini John Cooper Works WRCs, prepared by the Banbury-based Prodrive organisation that previously achieved WRC glory with the likes of Colin McRae and Richard Burns. The famed British marque has not been represented in top-level rallying since the Sixties but what an impact its 2011 cars, driven by Spaniard Dani Sordo and Northern Irishman Kris Meeke, have had already. In just five appearances Sordo has achieved four strong points results and almost won a month ago in France. Meeke, in his debut WRC season, was a fine fifth two weeks ago in Spain and, on terrain he knows well, could cause a real upset on his home event. Indeed a British driver has not won Rally GB since Burns’s triumph in 2000 and MINI’s only previous victory on the event was in 1965 (with Rauno Aaltonen in a Mini Cooper S)! Other stars to look out for include former F1 World Champion Kimi Raikkonen and YouTube hero Ken Block – both are sure to be crowd favourites and in huge demand from autograph hunters. It all adds to up to a fitting season finale for the reinvigorated WRC which, looking to the future, is entering its most exciting chapter for years with the re-installation of the classic Monte Carlo Rally on its 2012 calendar plus the arrival of MINI as well as German manufacturer VW in 2013 to add to the competition. 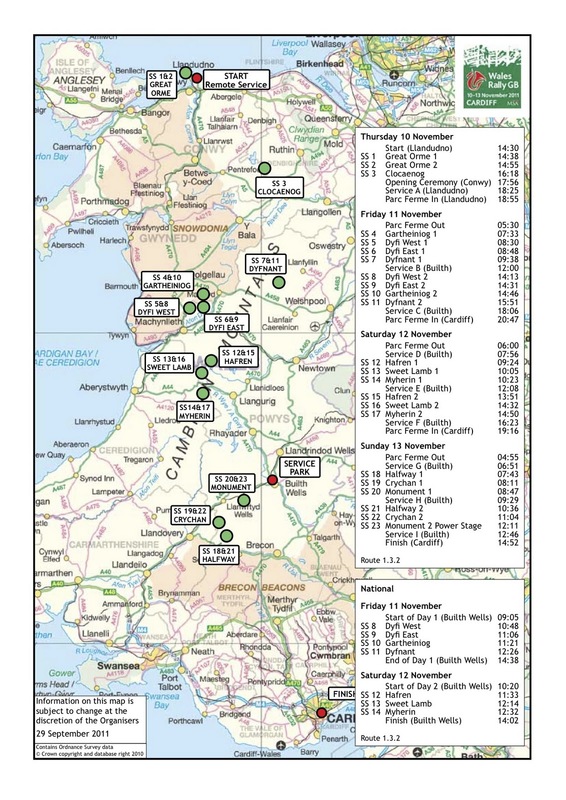 Meanwhile this year’s Wales Rally GB includes a considerably revised route compared to previous years – following a Ceremonial Start on the Thursday (10 Nov) in Llandudno the opening action is on the spectacular winding cliff-face road around the Great Orme headland on the North Welsh coastline – a stage not used on the event for 30 years. Similarly, there is a return later that day to the Clocaenog forest stage, last part of the route in 1996. 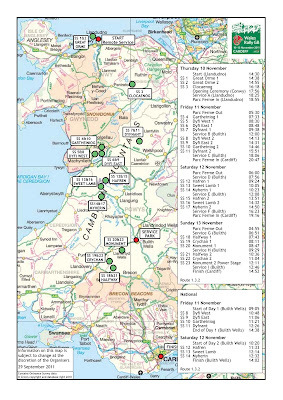 Over the next three days the 1150-mile event will venture southwards with the high speed action on many of Wales’ most renowned forest stages interspersed with a Central Service Park at Builth Wells. The event, and the 2011 World Rally Championship, will culminate with a Ceremonial Finish – and the crowning of this year’s WRC Champion – in Cardiff on the Sunday (13 Nov).